If you have made the decision to invest in your oral health and quality of life with dental implants, you are making a wise choice. However, you are sure to have plenty of questions about the implant placement procedure and recovery. As your implant dentist in Marietta, Dr. Jeff Lee understands you have many questions and concerns. To help put your mind at ease, he has the answers you need to promote a smoother recovery. After your implant posts have been placed, you will bite on gauze for about an hour to allow a blood clot to form at the surgical sites. In most cases, bleeding is not an issue, but if it persists, you will need to change the gauze about every 30 minutes. During the first day, you will still feel the effects of the sedation medication so you will need to take it easy and have someone help you throughout the day. You need to take extra precautions to avoid causing damage to the surgical site, such as rinsing your mouth vigorously, smoking, or eating hard foods. When performing your oral hygiene routine, be very gentle around the surgical sites. It is best to eat liquids for the first day, such as broth and soups. It is not unusual for some bleeding and oozing to occur. You will also likely experience some pain and swelling, which can be managed with ice and pain medications. During the next couple of days, you will need to continue keeping the surgical sites clean and avoid anything that can cause damage or injury. At this point, you may have developed bruising, stiff jaws, or a sore throat. This is normal and will subside within a couple of days. To resolve the discomfort, stay hydrated, use cold compresses, and pain medication. It is not unusual to feel sharp edges in the gum tissue as bone walls that supported the teeth work themselves out of the gum tissue. In about a week, you should feel back to normal and able to resume your usual diet. Now that you are feeling better, you are anxious to complete the process and want your dental crowns placed. However, while the healing process is almost complete on the surface, there is still some healing left to do. Your jawbone still needs to fuse to the implant posts. This process can take several weeks. 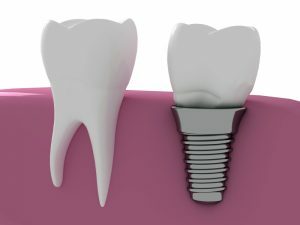 Therefore, you still need to wait a while until the abutments and dental crowns can be attached to the implant posts. While it can be difficult to remain patient, it is vital to ensure the long-term success of the procedure. If you are ready to restore your smile and quality of life with dental implants, Dr. Lee at Muskingum Valley Oral Surgery can help. Dr. Lee will create the comprehensive treatment plan you need to replace your missing teeth. Contact our office today to schedule your consultation for a complete smile.